If you’re looking for something fun to do with the kids this weekend, our good friend Christiane Lemieux (the force behind DwellStudio) will be teaching an art class. Details below. Hi all New Yorkers and visiting New Yorkers! I’ll be teaching an art class for 5-12 year olds at the Children’s Museum of Manhattan this Saturday afternoon. I’d love to meet some of your smiling faces and work with your kids on creating art inspired by nature. Obviously I’m very inspired by nature in our designs, so this will be a fun class for me. Hope to see you there! Explore shape and color through painting/drawing everyday objects in nature with Christinae Lemieux, mom and Founder/Creative Director of DwellStudio. Snowfall! 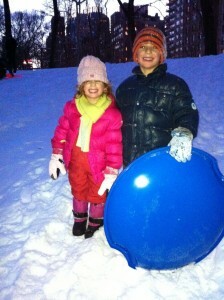 Today we found a couple of used sleds in the basement of our building and headed straight to Central Park. Pure joy – for the kids and me. To see their little faces with big eyes beaming and hear their screams as they headed down the hill – nothing like it. It was a beautiful, crisp evening — we stayed just until sunset. None of us wanted to leave (“one more time, dad!”) Came home to hot chocolate with marshmallows. All is right with the world. 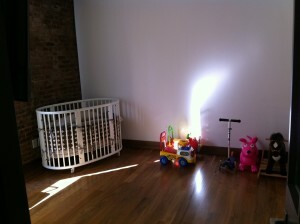 Today we moved from our SoHo loft, where both of our kids were born (not literally). We are really excited about our new apartment and neighborhood (also downtown), but also quite nostalgic. It seems like yesterday that we brought them home from the hospital, the little nuggets tucked snuggly in their car seats (now they beg me to sit in the driver’s seat – not happening of course). It’s been an incredibly special and memorable five years filled with lots of exciting events and many firsts. As we were packing, pouring over each and every belonging (keep, sell, throw out, donate? ), we couldn’t help reflect over all the memories. Our son sleeping soundly in his crib that first night (and us checking every moment we could), our daughter happily eating mashed peas in her high chair, the two of them crawling around in their cute little clothes. Parting with some of these things is hard. So it felt good to know that the owners of our old apartment would be using some of this loved and gently used baby gear for their own children. As our family has grown out of these items, now it’s their turn to create their own memories. It may sound cliche but it all goes so fast – it feels good to take a moment and reflect.. Sometimes our bed looks more like a playroom than a bed. 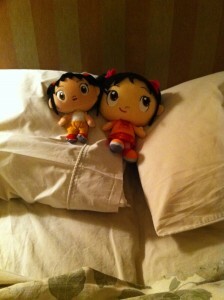 Last night I found two Kai Lan dolls warming our pillows. I often find myself in the car alone, and only after about fifteen minutes do I realize that I’ve been singing along to Dora or The Mickey Mouse Club. I wouldn’t change it for anything, but WHAT’S HAPPENED TO ME?! Been there? Yesterday was my son’s birthday, and we may have found the BEST birthday cake ever! Little Cupcake Bakeshop (www.littlecupcakebakeshop.com) on Prince Street in Nolita is a charming, old-school bakery serving the most amazing cupcakes and cakes. 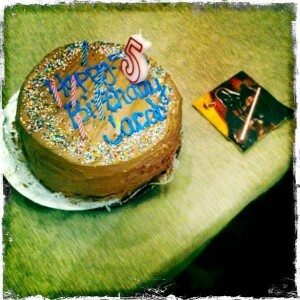 We had the vanilla cake with chocolate icing, and it couldn’t have been better (said the adults and kiddies). Off to the gym!